Cells that save lives are valuable! Cells that alleviate pain and suffering in millions of people are valuable! Closed Cytocentric approach delivers the promise of cell therapy faster, at less cost, with less risk, and better outcomes than conventional open methods! Heart Attack & Stroke: 16 Million Deaths/Yr. For the first time in the history of medicine, there is now hope for millions of people with intractable disease and injury. New therapies based on the natural developmental ability of cells to regenerate and heal and fight disease are on the horizon. Amazing stories of success in pre-clinical animal models are reported almost every day. We all know it's only a matter of time before these get refined and move into the clinic. If these are your cells, you will positively impact the lives of a lot of people! Not only will these new cell therapies save lives and alleviate pain and suffering in huge patient populations, but they are also expected to save the taxpayer trillions of dollars. That's why national and state governments worldwide are pouring billions of dollars into the research to develop these new cell therapies. The California $3 Billion Stem Cell initiative may be the most famous, but it's only one of many. Private investments are also rising rapidly. Now even big pharma is jumping in. The promise is too big to ignore! 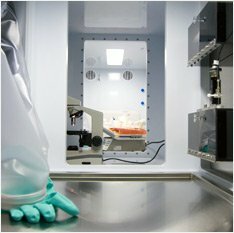 Growing and processing cells in open incubators and open hoods is so prone to contamination risk that the regulatory agencies demand cell production be performed in clean rooms to achieve clinical grade cells. Cleanrooms are costly, take a long time to plan, take a long time to build, take a lot of space, impose many operational and financial risks, and still leave people in the same space as the cells. Handicaps inherent in conventional open people-centric equipment impedes progress. Discover how the Cytocentric approach is a practical, economical, and superior alternative. If you are working with cells in the cell therapy arena, even upgrading conventional people-centric equipment with cytocentric features is not enough. The practical and strategic advantages of the full cytocentric-by-design Xvivo System® model X2 are too compelling... in all phases of development. The Xvivo System model X2 is the subset of our Cytocentric Platform designed for GMP compliant cell processing and production. It is not addressed in detail on this website, only in a general overview of its’ significant role in cell therapy on this page. For more information on the GMP compliant Xvivo System® model X2 go to the BioSpherix Medical website. CYTOCENTRICITY ALIGNS NATURALLY WITH REGULATORY COMPLIANCE! Challenges are many, but the reliable production of clinical grade cells is easier when you meet the needs of the cells. Is it a coincidence or is it just common sense? The essence of GMP is quality and if you consider cells as a product, cytocentricity makes sense. A quality cell product is more assured if you protect from contamination, avoid suboptimal conditions, optimize cell parameters, simulate physiologic cell requirements, keep up with changing culture requirements, and all the other Cytocentric Principles. Learn just how closely aligned Cytocentricity and GMP are, and even how Cytocentricity raises the bar. Can anyone ever make any money with cell therapy? Two diametrically opposite business models are proposed. Both have doubters. The traditional big pharma business model is where the cell is a uniform product mass produced in a huge centralized GMP compliant factory and then shipped out frozen in vials to clinics worldwide, then stored in freezers on-site until administered to the patient when needed. Many worry about the compatibility and utility of an allogeneic cell. The alternative clinic based business model using patient specific GMP compliant cell and tissue processing in the clinic near the patient is the other business model. Doubters here worry about the high cost. But the drive for cures is so strong that both models are probably viable. Certainly both models are actively being pursued. 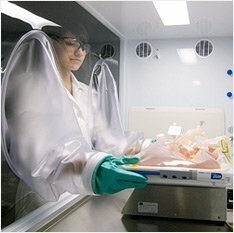 Obviously the Xvivo System® model X2 is perfect for patient specific production in the clinic, but even the mass production model if successful has that final processing point where it may also play a key enabling role in the final thawing and washing and prepping of the cells before they go into the patient. of these new cell therapies. Current cGMP guidelines from the US FDA as well as comments from FDA personnel indicate an increasing regulatory preference for advanced aseptic processing, specifically isolators for future facilities. 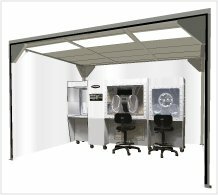 As a result, standard Cleanroom technology may not be considered viable for new facilities in the near future. Cell therapy is the next evolution of medical treatments. It offers the promise of huge benefits for millions of people with currently untreatable diseases and devastating injuries. What truly differentiates cell science from molecular therapeutics is the innate characteristic of cells to grow, differentiate, seed and integrate naturally into tissue, develop, heal, battle infection, etc. which all have potential to provide a cure for failing and impaired cells and tissues. Cell and gene therapy and regenerative medicine are revolutionary approaches that actually may cure afflictions as opposed to treating them. The challenge is to consistently produce and safely deliver these therapeutic cells. The best tools maximize the odds that you and your cells can do it !